Join MCC in remembering the life of Rev. 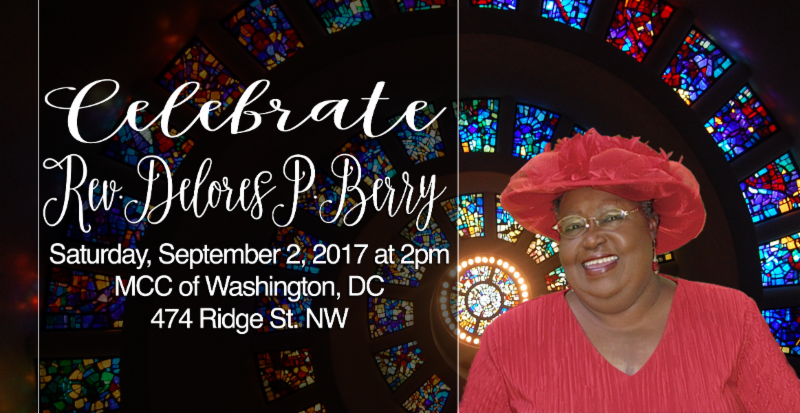 Delores P. Berry Saturday, September 2, 2017, at 2 pm at the Metropolitan Community Church of Washington DC. Don’t forget to pack your favorite hat to celebrate the life of our beloved Gospel artist, prophet, and friend. If you are joining us from out of town we have secured a room block at the Hampton Inn Convention Center, a few blocks away from the church for $129/night. To book, call 202.842.2500 and say you are with Metropolitan Community Churches. For those unable to attend, you can join us online: https://mccdc.com/mccdc-live-services/ or search for MCCDC on livestream.com. Funding Lay and Clergy Leadership for People of African Descent. MCC who are of African Descent. Share your favorite stories and photos of Rev. Delores Berry. MCC will be creating a slideshow with photographs from throughout the life and ministry of Rev. Delores Berry. Those who have photos they would like to share are invited to send those to [email protected].